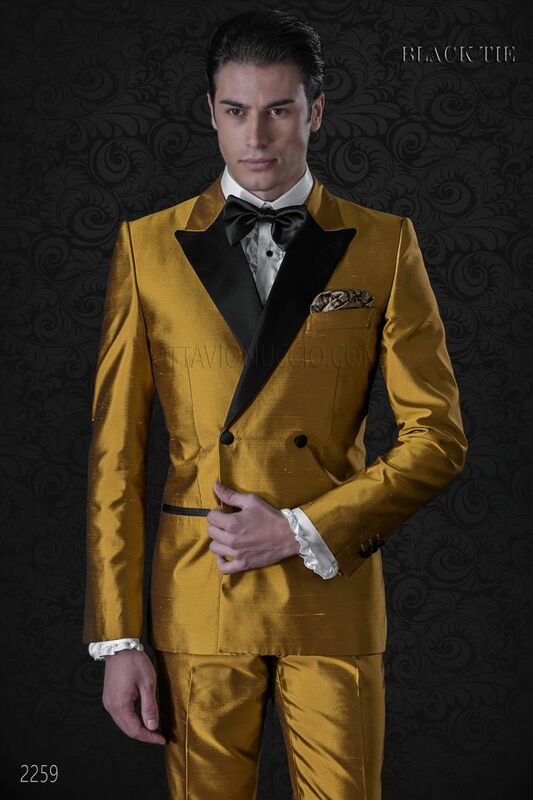 Double-breasted tuxedo in golden shantung silk. Contrast fabric black peak lapel and 4 matching fabric covered buttons c... Double-breasted tuxedo in golden shantung silk. Contrast fabric black peak lapel and 4 matching fabric covered buttons closure. Contrast jet pockets and straight buttonholes.3 covered buttons and straight buttonholes for each sleeve. Back side with no vents to better wrap hips; length of jacket is suitable for any height. Shirt made from white viscose lurex with standard collar. Ruffles along the placket and cuffs. Exposed placket with bla... Shirt made from white viscose lurex with standard collar. Ruffles along the placket and cuffs. Exposed placket with black diamante embellished buttons. Convertible cuffs with black diamante embellished button. Handkerchief made from gold and black jacquard silk. Handmade.